Although real, and close to how we see the world, perspective views are not the best way to technically show lengths and proportions of any structure’s elements. Isometric drawings are especially useful when your end-point documents need to show 3D objects in two dimensions (which is what contractors use to plan out their construction). They maintain the proportions of your structure without losing its unique shape because of the identical view angle they take. OutsourcePlan produces 3D isometric visualizations of your design and offers reproduction of a scalable part of your design too. All is put together by an experienced team of architects and modeling technicians. Isometric drawing services map X, Y, and Z axes at 3 constant directions; each 120 degrees away from another on paper and therefore they make up a complete circle of 360 degrees. Z is vertically set and X and Y, one mirrored off the other, both diverge 30 degrees from the horizontal baseline. Every line in your structure that’s parallel to either one of these axes, will maintain their actual size and scale comparing to the whole; while the rest will have varying proportions. 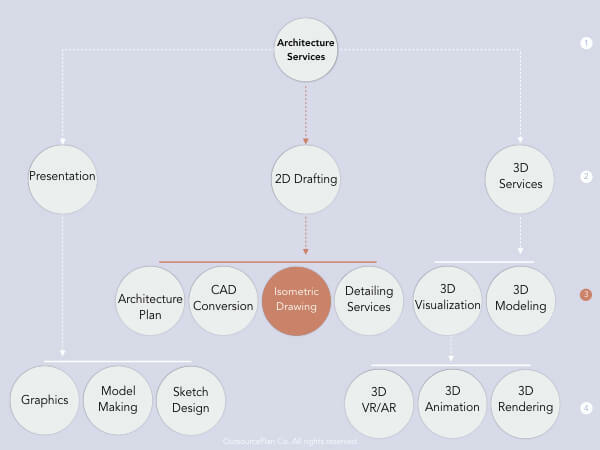 There are numerous uses for such diagrammatic 3D drawings. As for different support systems of a building, civil engineers and architects often use isometric drawing services to show mechanical, electrical, piping, heating, ventilation, air-conditioning, and sewage systems; or as for structural drafting drawings they show, fabrication techniques, connection, and structural details, and different assemblies of structural joints and bolts. And finally, they use isometric drawing services to show architectural relations in a building, repeating patterns of a parametric structure or exploded views of an assembly that is mostly used for reverse engineering. Our professional team of architects, engineers, and technicians, have been providing isometric drawing services to a wide range of clients with different industrial backgrounds. We will make sure everything is in place and as it is often the case with the tangled process of design all the way to manufacturing, you get thorough editable documents for your architectural detailing services. All the documents will be delivered by the software of your choice. Our mission at OutsourcePlan revolves around producing the most accurate outcome in one go. We produce the base 3D isometric visualizations of your design and offer reproduction of a scalable version of your design too. Here we say how we do isometric drawing services for our clients, what makes us more appealing among our competitors, and what tools we offer to implement your precise isometric drawings. Our professional, collaborative teams of architects, graphic designers, and technicians will be available 24/7 to make sure you’re provided with the best Isometric Drawing Services; hopefully as close as it can get to what you want your details and structure to look like in real life. Is widely-known for 2D construction documents. It is the most common tool for producing CAD-standard files. It is the one of the most common tools for Isometric Drawing Services. Revit can take care of your modeling, rendering, and BIM-oriented reports of any design. 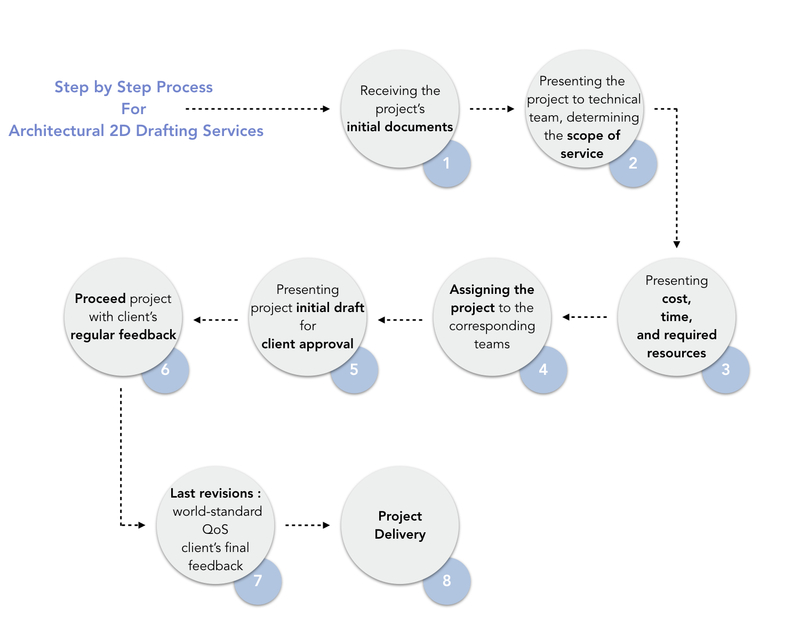 It is a powerful tool to adjust a project as it progresses and changes along the way. Modeling a building in revit is more than merely modeling it’s volumes; rather it models the whole construction process. It also encompasses a vast repository to place structural frameworks and fixtures in place through your project, as they are industrially made. It is a comprehensive tool for Isometric drawing services. Is another 3D modeling software, that is more focused on mounting BIM tools on your project. It helps deepen the visualization of your design down to all the hidden construction layers of your building; all of which could be documented for CAD Conversion Services. Is a NURBS-based modeling tool that facilitates the creation of curved forms. It responds to industrial engineers, jewel designers, architects, and a score of other fields. It has a vibrant supporting community and a great number of plug-ins for implementing complicated forms that are can not be done otherwise or at least with insurmountable effort. Some of our clients prefer to have their Isometric drawing services done in Rhino, so we have a branch of technicians and drafters just for that.